With a nearly infinite number of uses in event settings and retail spaces, these small yet visible mini chalkboard signs are a great way to direct guests and customers while complementing rustic themes and decors. 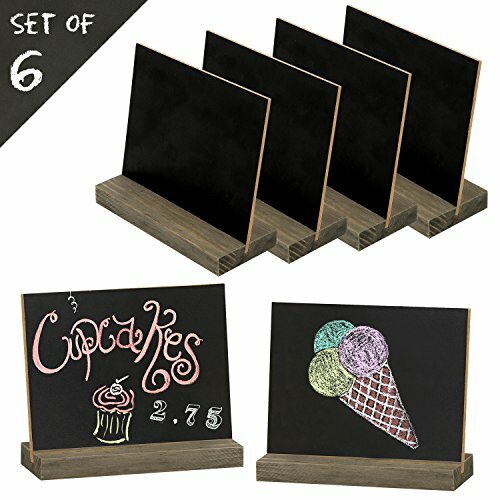 Featuring simple woodblock bases with a distressed finish, these unique table signs have a welcoming laid-back look, while the reusable blackboards allow for an endless variety of creative messages. The boards and bases disassemble for compact storage and portability, making these mini tabletop signs ideal for busy shops, restaurants, and event spaces. CHALKBOARD PLACE CARDS: A set of 6 removable chalkboard place cards with distressed wood bases. RUSTIC-CASUAL STYLE: Simple woodblock bases with distressed finish complement a variety of event, restaurant, and shop decors. VERSATILE SIZE SIGNAGE: Each sign is perfectly size for dinner tables, buffets, and party events. INCLUDES CHALK: Comes with starter pack of chalk (not recommended for use with liquid chalk markers). SPECS: 5.1 H × 5.9 W × 2.4 L (in inches).